'My Line' (Mary Dunn, R. 1992). Seedling# M83-817E. TB, 38" (97 cm), Midseason bloom. Standards white with wide deep violet band, violet midrib stain; style arms deep violet; falls deep violet, large white zone at beard area; beards pale yellow, tipped white. 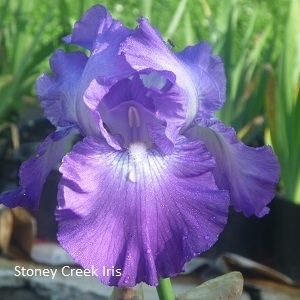 Ghio seedling# 77-70: (('Premonition' sibling x 'Mystique') x 'Barletta') X 'Fancy Face'. MAD Iris 1993.